The first 3 Generations of Yu-Gi-Oh! monsters were Fusion Monsters, Contact Fusions, and Synchro Monsters. Xyz Monsters bring your Deck some 4th Generation power, because the 4th way to Summon from your Extra Deck is the easiest one yet! Plus they automatically work with ALL the monsters you already have in your Deck. No adjustments required! Two of the most powerful Xyz Monsters in Generation Force are the twins of good and evil: “Tiras, Keeper of Genesis” and “Adreus, Keeper of Armageddon”. Tiras cannot be destroyed by card effects for the 2 turns after it’s Summoned. Tiras also automatically destroys 1 extra card each turn it battles. Adreus’ effect is similar, but faster: each turn you can instantly detach 1 Xyz Material from Adreus to destroy any of your opponent’s cards! Both of these Xyz Monsters have 2600 Attack Points, are Rank 5, and require 2 Level 5 monsters to Summon. Since you can use ANY monster to Summon them, it’s easy to do! You can use Level 5 monsters you already have, like “Cyber Dragon”, “Quickdraw Synchron”, or “Grandmaster of the Six Samurai”, or try the brand new “Ghost Ship” card from Generation Force. Take a look through your collection and see what other Level 5’s you might have. You’ll be surprised how many of them are easy to Summon! Generation Force is packed with new cards that make it easy for you to Xyz Summon. “Wind-Up Soldier” and “Wind-Up Dog” can both change their Levels to Level 5 once they’re on the field. This makes it easy to get 2 Level 5’s, so you can Summon Tiras or Adreus. This combo gets even faster if you use other Wind-Up cards like “Wind-Up Magician” and “Wind-Up Factory” to get exactly the right Wind-Up monsters you need out of your Deck – fast! With “Wind-Up Magician”, when you use the Level-modifying power of your “Wind-Up Soldier” or “Wind-Up Dog”, you can Summon another one from your Deck. Then use its power, and you instantly have 2 Level 5 monsters on the field. Tiras or Adreus – incoming! Another short cut is “Gagaga Magician”. This monster can instantly change its Level to whatever Level you need, from 1 to 8! If you have “Gagaga Magician” and any other monster, just match Gagaga’s Level to the other monster and Xyz Summon any monster of that same Rank. “Resonance Device” is a Spell Card that works the same way. Just use this handy card and 2 of your monsters will have matching Levels the rest of the turn. Another easy Xyz Summon! 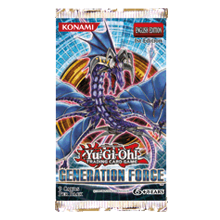 Generation Force has OVER TWENTY new cards for Fish, Sea Serpent, and Aqua-Type monsters. You can combine them into a cool new theme Deck, or use just a few of them in other Decks for their incredible combo power. Lots of these new monsters banish themselves after they attack. Then they come back during your next Standby Phase. This means they’re not around to protect you during your opponent’s turn, but it also makes them safe from harm, so it will be hard for your opponent to destroy them. Fish out your copies of “Deep Sea Diva”, because she’s in for the performance of her life! This monster from Raging Battle is really useful for Xyz Summoning, because she can Summon a matching-Level monster when you play her. But now your Diva can also Summon “Lost Blue Breaker”, a Level 3 Sea Serpent that you can Tribute to destroy any Spell/Trap on the field. White Synchro Monsters and Black Xyz Monsters are opposites of each other. But they both work perfectly in combination. Instead of using just one or the other, your best strategy is to play with BOTH in your Extra Deck. That way, all your bases are covered. If you get your Tuners into play and want to Synchro Summon, you can do that. But if the Tuners aren’t showing up, you can Xyz Summon instead! If you plan to keep Synchros in your Extra Deck though, watch out for trouble. One danger is “Steelswarm Roach”. This Rank 4 Xyz Monster can negate the Special Summon of any Level 5 or higher monster, whether it’s a Fusion, Synchro, or anything else. But since Xyz Monsters don’t have a Level, they’re immune to “Steelswarm Roach”’s power. Synchro Monsters also have a traitor in their midst! Their biggest enemy might be a Synchro Monster itself: the treacherous “Orient Dragon”. Finally, Generation Force contains 9 new cards for HERO Decks! “Elemental HERO Flash” and “Elemental HERO Nova Master” are joined by the new Masked HERO and Vision HERO monsters. Whether you already have a HERO Deck, or have just thought about making one, this is the biggest batch of HERO cards in one set since 2006! Generation Force isn’t just the first booster set with Xyz Monsters (and a whole lot more). It’s also the first booster set printed with the new Problem-Solving Card Text. Now your cards will have more information printed on them about how the cards work. So even if your Duels get really complicated, you can easily work out what happens!